You are here: Home / Climate / Gillard finished as Australian Prime Minister? No idea why Facebook is refusing to import a relevant image from the post. Anyone know any more? No direction is a whole lot better tha the one Gilard has planned for us. So what would happen, in an election, if Rudd took over and dropped the Carbon Tax? The tables would be turned, with the Coalition planning to spend money on CO2 and Labor not. Rudd could say that the situation has changed in terms of economics and scientific certainty – it has. That would probably force Abbott into doing a ‘me too’, which is not a good look for an election. It would lave Rudd with the ‘sugar hit’ advantage and looking the more decisive. Labor would probably win. Hooray, the sooner the better , but the really scary thing is who will they replace her with.There is no one with any morals or brains is there? Keep an eye out for the runner on the inside rail bolting towards the finish line, just behind Joolya and Kevin O’Lemon, named Bill (my odds have) Shorten’d. He’s the only one jockeying for a big finish! Why would an election be needed when Mr Rudd becomes PM? MP’s are motivated by self interest. Some of those cross bench sitters know that they will be turfed out at the next election, so they won’t be interested in having their time in parliament shortened by a year or more. My guess is that Mr Rudd will kill two birds with one stone. He will get even with Ms Gillard, and pull the rug out from under Mr Abbott by postponing the implementation of the CO2 tax sine die. He will call the the green senators’ bluff: will they oppose every bill sent to the senate out of resentment for the CO2 tax being shelved? While being a recent convert to conservative politics, I could consider giving my vote back to Labor if it could get the green monkey off its back. …..but I thought her poll numbers were recovering??? it said so in the news just last week, therefore it must be so! what are the odds of a quick hand over to Shorten while Rudd is out of the country? Rudd would be a deluded fool to take over the leadership. Labor is doomed at the next election. It’s going to be a bloodbath and rightfully so. The Labor Party has to start planning for the subsequent election and try and minimise the damage for this next one. Best to put in a caretaker (maybe that is Rudd), ditch the Greens, restore some confidence from its traditional moderate voter base, call an early election, lose gracefully and plan on competing for the following election. I find it odd that there is a lot of love for Rudd to comeback. People need to remember that the guy is massive narcissist, selfish and delivered some terrible policies. At the best of times I am reluctant to vote Labor because I dislike socialism and some of their ridiculous social stances on issues but I am still baffled that leftists could consider voting for them. A rock and a hard place is where all of labor faceless have managed to successfully instal themselves. The egotistical backslappers proud of disposing Rudd, mysteriously now in mute hiding as they can not agree on a replacement for Madam Most Unpopular, as numbers for Rudd are still higher than those for the union faction’s nominations. No doubt the union faction who bent over to allow Gillard in to steer the ship are now not so supple and instead standing proudly vertical and rigidly erect as they now demand repayment in kind for one of their faction to become PM. So it is to be assumed that there is a lot of 1,2 ing….Dam still not enough! Meanwhile the mode of transport will now be dodgem cars until the last car remains operational……. GJTB just wishes more people take an old boot around to their nearest labor member’s office and ask the officer TO GIVE JULIA THE BOOT ! I am yet to hear anyone say “the Prime Minister has my full support” (though I am not watching/reading every sordid detail), so I imagine as soon as phrases like that start appearing, then it’s all over for Gillard. No to mention Bill Shorten saying “I have no aspirations to be PM”. It would be satisfying to see Ms Gillard removed in the same manner as Mr Rudd. Regardless of Labor/Liberal ideology, no government should be allowed to stay in power when it treats the people it is supposed to govern with such contempt and disrespect. Even if she goes, there will be no real change in policy, but the Conservatives should use this to their advantage by calling for a vote of no-confidence in the government, which should trigger an election. So, whoever was talking to this minister didn’t recognize him or her – are these labour ministers so invisible and unknown that their names can only be whispered and not attributed to any under the cloak briefing? If the ALP currently has no direction, then I would consider the current climate a rousing success. As much as Gillard tries to say that we’re moving forward, it’s not always a good idea if you’re facing the wrong way. Julia Gillard’s Carbon Tax is doing to Labor what Meg Lees GST did to the Democrats… and it ain’t pretty. By breaking its election commitment on the Carbon Tax, Labor has lost a lot of its voter base. At the next election it wont matter who is at the helm, the ship is doomed to a watery grave. Whose fault is it – she brought this calamity down on herself – it’s just plain stupid [even for this woman] and couldn’t have happened to a nicer lady[?]……….. . Australia needs a stable and rational PM, so it’s gotta be: bye bye Joolya. No one will weep when you go luv. Other plus points, labour tears itself apart, good news all round for Aussies. I doubt that Bill Shorten would want to accept what would be a “poison chalice” in view of the inevitable defeat Labor faces at the next election, whenever that may be. The likelihood that the Greens, Wilkie, Windsor or Oakeshott would withdraw their support if Rudd were to become PM is I think extremely remote, they know they are “mince meat” if they do. More likely, some low profile Labor back-bencher(s) will say that enough is enough and resign. But given the Machiavellian players involved who knows what might eventuate? Not only Gillard is rotten, the whole system is rotten. All professional politicians should be sent home.They all are power junkies. Are they working for us or are we working for them.Like members of the jury they should be chosen arbitrarily. 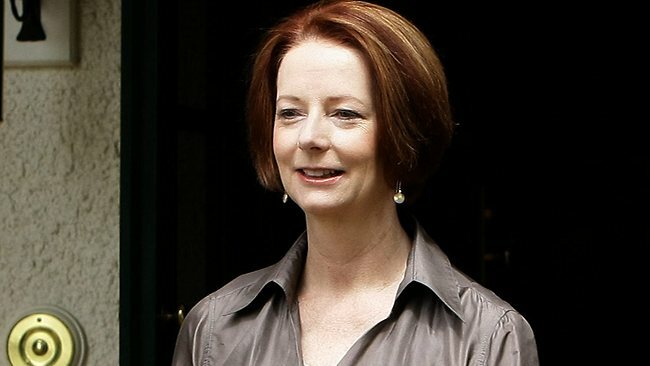 Gillard really has ruined any chance for any future female candidates to become PM. Oh, do you mean is the Australian Labor party finished in it’s entirety? Absolutely. The scary thing is that as the ALP rip themselves to pieces in this obscene display of lying, rent seeking, privateering arrogance, the Australian communist party V2.0 (aka the Greens) garner more and more support from the ignorant and naive ALP supporters. The Greens are to the ALP what one nation was to the LNP some years ago. Only due at least one of the Greens training and preparation from Moscow in the 80s, they’re doing a much better job of being a parasite Party than one Nation did. I am conservative, but I fear the consequences of the ALP demise – LNP will get in in a landslide and will be blocked in the senate by the Moscow party. This ill raise the profile of the moscow party even further. Not Good.